Many older homes and buildings have wide window sills and/or a ledge. The Res-Q-Ladders and Quick-Escape ladders ONLY work on window sills less than 10 inches. That is, the throat of the attaching hooks will only go over an area 10 inches wide. If the depth of the wall (measuring from inside wall to outside wall) is more than 10 inches these ladders will not work properly. Please view our alternatives. You can convert your portable ladder so it will fit any size window sill. The existing handles can be removed and the chain portion of the ladder is fitted with a hook (spring snap or carabineer hook). This allows you to attach the ladder to a permanently mounted "screw eye" you install in the window sill, wall or floor. Screw eyes need to be mounted in a secure method. This may void manufacturer's warranty. 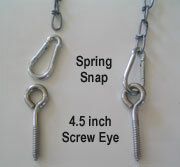 To do this, remove the handles and place a "spring snap or "carabineer hook" on the last rung of the chain. Secure a 4-1/2 inch "screw eye" into a solid portion of the window sill or window sill frame. These "screw eyes" should be 12 inches apart. We suggest you use 4-1/2 inch x 3/8 inch Stainless Steel Screw Eyes rated at 275 lbs and 7/16 inch Stainless Steel Spring Snaps rated at 275 lbs. The Red Rung ladders are mounted inside below a window and therefore they work with larger window sills. The Fire Flight, Fixed-Escape and Commercial Fixed-Escape Ladders are three different permanent ladder systems that are all mounted on the exterior of the building and not dependent upon the depth of the window sill. They are architecturally discreet.